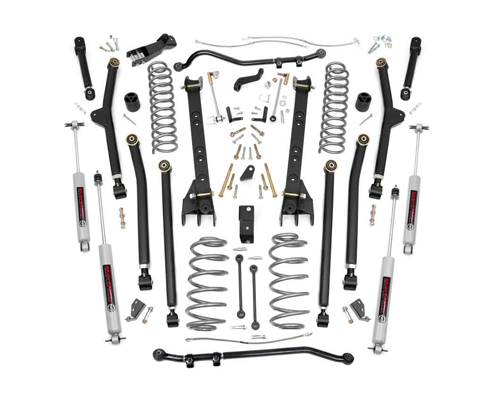 Front: High flex coil springs, adjustable upper control arms, adjustable lower control arms, control arm mounting brackets, adjustable track bar, track bar bracket, pitman arm, sway-bar disconnects, stainless steel braided brake lines, bumpstops, hardware. Rear: High flex coil springs, adjustable upper control arms, adjustable lower control arms, adjustable track bar, extended sway-bar links, stainless steel braided brake lines, bumpstop extensions, hardware. Unbeatable value and best prices in the market. A Slip Yoke Eliminator with an extended CV Driveshaft is recommended to avoid driveline vibration.